The government has promised an overhaul of employment rights to improve conditions for millions of workers, including those in the gig economy. The changes include stricter enforcement of holiday and sick pay rights, and higher fines for firms that breach contracts or mistreat staff. It is a response to last year's Taylor Review into working practices. Business Secretary Greg Clark said the measures would "address very clearly" the rights of those in insecure work. He told the BBC that very often a worker did not have the ability to challenge or force a company to follow the law. "We will be enforcing the rights that people have and are entitled to," Mr Clark said. He added: "We want to embrace new ways of working, and to do so we will be one of the first countries to prepare our employment rules to reflect the new challenges." Although the government says that nearly all the recommendations of the Taylor review will be adopted, unions have said the plan will still leave 1.8 million workers without key rights. What's new in today's announcement? Much of what has been announced simply involves enforcing and clarifying existing laws. So, for example, people who are officially classified as workers are already entitled to sick pay and holiday pay, but many of them don't know that. It can certainly be confusing. Uber drivers are now considered to be workers, so they are entitled to these benefits. Yet Deliveroo riders are still classified as self-employed and that means they're not eligible. The government's plan will make sure that everyone knows what they're entitled to when they start working for a company and the rules will now be enforced by HMRC, so people actually get what they're owed. Undoubtedly, that's good news for some workers. But in terms of giving people new rights, it's pretty limited stuff. The Taylor Review concentrated particularly on the so-called gig economy of part time and flexible workers. It said all work in the UK economy should be "fair and decent". The quantity and quality of jobs in the gig economy will be monitored and steps will be taken to make sure flexible workers are aware of their rights. The government is also asking the Low Pay Commission to consider a higher minimum wage for workers on zero-hour contracts, and says it may also repeal laws that allow agencies to employ workers on cheaper rates. Matthew Taylor, the author of the original review, called the government's response "substantive and comprehensive". He said: "It will make a difference to the lives of the most vulnerable workers and that is what matters. "I welcome the range of specific commitments to improve the protections and rights of workers and to enforce those rights more strongly. "On important issues, including pay for variable hours workers, employment status and representation of workers I welcome the direction indicated today, but there is more work to be done to encourage the Government to be bold in living up to its commitment to good work for all." Richard Laughton, Sharing Economy UK Chair, the trade body for the sharing economy industry, said firms welcomed the government's plan. "Many people hugely value the flexibility that platforms provide and have been able to participate in the employment market for the first time. "Greater clarity on knowing when they are to be paid will help individuals make informed choices." Mr Laughton who is also chief executive of easyCar, added: "It's essential that updates to the UK's labour market continue to promote entrepreneurship, encourage participation and maintain flexibility while helping to develop skills." However, unions have been far more critical. Dr. Jason Moyer-Lee, General Secretary of the Independent Workers Union of Great Britain (IWGB) said: "Like the Taylor Review, it so far appears big on grandiose claims, light on substance. "The most important single thing government could do is introduce effective government enforcement of employment law. They say they will do this but give no indication of how." TUC General Secretary Frances O'Grady added: "The government has taken a baby step - when it needed to take a giant leap. 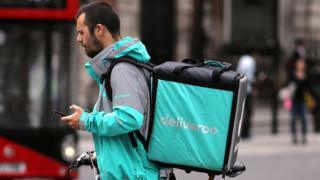 "These plans won't stop the hire and fire culture of zero-hours contracts or sham self-employment. And they will still leave 1.8 million workers excluded from key protections. Stephen Martin, director general of the Institute of Directors, said: "This could be the biggest shake-up of employment law in generations. It is right, therefore, that government proceeds cautiously by consulting widely. "However, while they have accepted almost every single recommendation from the Taylor Review, and in some cases even gone further, the lack of action on tax reform is a wasted opportunity."